With a bright paper surface, the colors will look vivid. 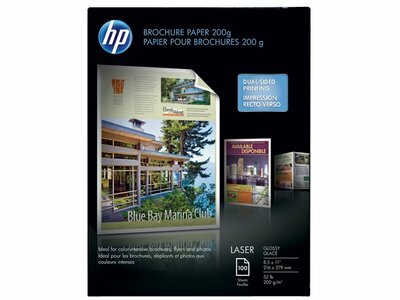 This HP brochure paper with a 2-sided glossy coating is great for special handouts. 5-layer premium-gloss finish creates dramatic-looking colors. Brilliant 97-bright surface gives you sparkling images. Color laser paper feels like true photo paper. Ideal for family albums and frames and strong enough to withstand frequent handling. Glossy paper in a pack of 100 sheets lets you print plenty of brochures. Heavyweight, two-sided glossy paper for impressive color images. Print outsource-quality, professional brochures in-house! Heavy-weight, double-sided glossy paper to make all your projects stand out. HP's proprietary, five-layer technology enables vibrant colors and eye-catching images. Guaranteed for optimal performance on HP color LaserJet printers. Optimized for HP ColorSphere Toner. Not recommended for HP Color LaserJet 4500/4550/1500/1500L/2500n/2500L/2500tn or 5/5m printers. Compatible with most other color laser printers and copiers.